DALLAS -- How do you counsel an abusive husband? Why should you re-evaluate a ministry every 18 months? Why do 60-year-old pastors tend to stop leading and start following? Should a pastor lead a split from a church? How do you find and attract good staff members? What is the most important responsibility of a pastor? Two veteran ministers answer these and a host of other questions in a new book aimed at helping pastors at any stage of ministry, no matter the size of the church. Mac Brunson, pastor of First Baptist Church in Jacksonville, Fla., and James W. Bryant, professor of pastoral theology at Criswell College in Dallas, are co-authors of The New Guidebook for Pastors, released by B&H Publishers of LifeWay Christian Resources of the Southern Baptist Convention. The authors revisited the original Guidebook for Pastors written more than 25 years ago by W.A. Criswell, the long-tenured pastor of First Baptist Church in Dallas. Brunson is a former pastor at the flagship Texas church. The New Guidebook for Pastors frequently refers to the life messages, examples and writings of the two world-famous pastors of FBC Dallas, Criswell and George W. Truett, who "still encourage pastors today," the authors acknowledge. Brunson and Bryant also tap 21 notable Southern Baptist pastors, seminary faculty and other contemporary leaders who offer pertinent testimonies and insight based on years of experience in ministry. Four SBC seminaries as well as Liberty University in Lynchburg, Va., have added the book as required reading for students studying pastoral ministry. The book also has garnered trans-denominational appeal at Cincinnati Christian University. One director of missions in north Texas plans to give a copy to each pastor in the local Baptist association. The call to preach, the authors note, is a call to prepare, which is the focus of the first two chapters of The New Guidebook for Pastors. Bryant and Brunson also warn: "If you are in the ministry and do not have a clear, unquestionable sense of God's call, even though you may not be able to explain it, then you should leave the ministry immediately. The harm you can do to people, a congregation, your family, yourself, and the kingdom is beyond description." For pastors confident in their call, however, the authors concede, "There will be many times when the only thing that holds your hand to the plow is your call." The chapter titled "The Pastor and His First Church" cites questions that both the pastoral candidate and pastor search committee should ask each other. "Very few pastors stay at their first church throughout their entire pastoral career," the authors write, adding, "Many young pastors make mistakes in their first church that would be fatal if the church were not small, loving, and forgiving. "If a pastor wants to stay at a church, he should learn to practice servant leadership rather than raw pastoral authority, in spite of what many church growth publications suggest," Brunson and Bryant write, noting that a pastor who practices servant leadership gradually gains both pastoral authority and long tenure. "God has used many difficult churches in the lives of pastors to teach them how to be crucified with Christ and to stay on the cross like Jesus did," the authors observe. "The default attitude for the pastor is to stay, not to leave." Contrary to what many pastors and church members believe, the authors state that a pastor's "first and most important responsibility is to preach the Word of God" and not to cast a vision, attend the latest convention, be at every class social or make hospital visits. The primacy of preaching is why the authors included a step-by-step process on sermon preparation. As important as preaching is, however, Brunson and Bryant recognize how other vitally important matters can consume a pastor's time. So they offer practical tips on dealing with staff, worship, technology, missions and evangelism. proper, biblical administration of baptism and Lord's Supper, including theological and historical background for the ordinances. weddings and funerals as significant avenues for ministry. biblical bases of their reasoning regarding divorce and out-of-wedlock pregnancy. the minister's family, prayer life, finances, ethics, politics, moral issues, denominational relationships, retirement, reward, schedule and ministry burnout. An extensive appendix offers examples of a wedding ceremony, funeral service, public gospel invitation, staff organization chart, business meeting agenda, pastor's resume, salary and benefits, and advice on journaling, filing, calendar planning and personal library. The book notes that most pastors are terminated not because they are theologically unsound or unable to preach eloquent sermons, but because they are unable to deal appropriately with people and their problems. Therefore, Brunson and Bryant advise pastors on where to get counseling after termination. The authors pledged to be "comprehensive and complete" while recognizing that "each chapter could be turned into a book." 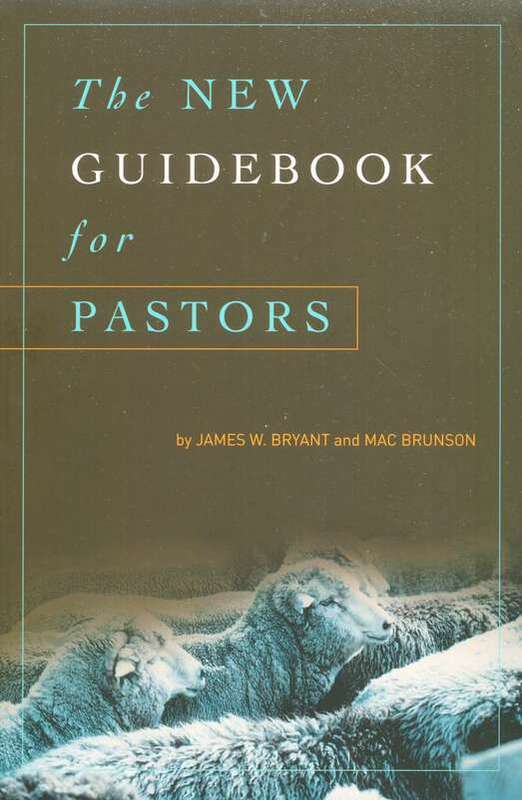 Noting that early books on pastoral ministry dealt with the spiritual aspects of the Christian ministry while later books shifted toward practical concerns, Bryant and Brunson see their book as balancing the two, dealing with the call to pastoral ministry before addressing numerous applications of that call. The extensive list of topics in The New Guidebook for Pastors reflects the varied skills a minister must bring to the pastorate, raising the question of how one man can succeed on all fronts. "The pastorate is hard work, and the pastor should work hard," Brunson and Bryant write. "Done biblically, approached spiritually, pursued passionately, evaluated constantly, and studied intently, the pastorate can be the most satisfying and blessed calling any man could ever hope to pursue." Tammi Reed Ledbetter is editor of the Texas Baptist Crossroads magazine published by the Southern Baptists of Texas Convention.